Chris Burton's list of achievements on the baseball field for Sam Houston State University is lengthy. He won all-conference honors in each of his four seasons at the school. He turned in a career batting average of .336. He also helped win three conference titles and make two Division 1 regionals, according to the school. With that resume, Burton made the school's Hall of Honor in 2007, after going on to a three-season professional career. Burton then settled in Texas, becoming a baseball instructor. Burton's connection and commitment to his old school later led his family setting up a scholarship fund in his memory. Burton passed away in August 2014, according to his obituary, after a brief battle with cancer. 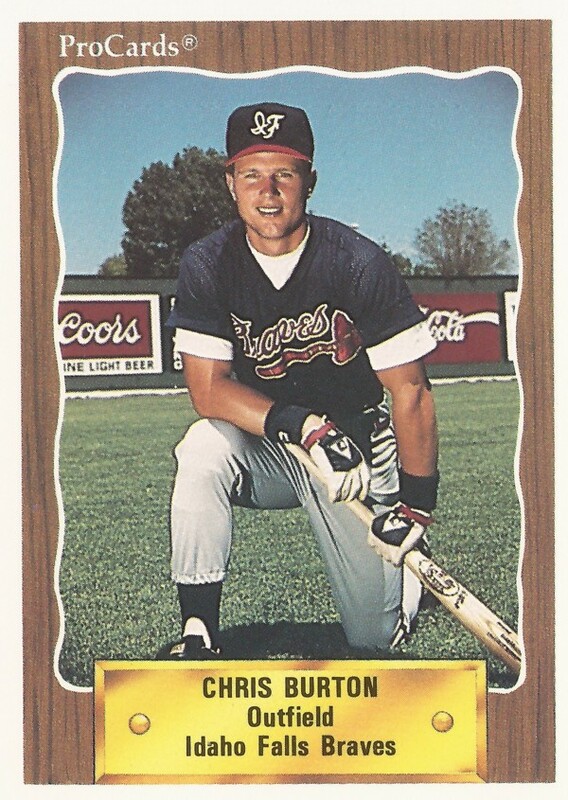 Burton's pro career began in 1989, taken by the Braves in the 28th round of the draft out of Sam Houston. Burton started with the Braves at rookie Idaho Falls. He got into 55 games and hit .269. He returned to Idaho Falls for 1990, improving his average to .305 over 66 games. He also saw six games at single-A Sumter. In a July 1990 game for Idaho Falls, Burton knocked a lead-off hit and soon scoredm helping his Braves to a win. Burton moved up to AA Greenville for half of 1991. He walked and scored in an August game for the club. He played the other half of the year at high-A Miami. He hit .225 overall, ending his pro career. Burton later worked for TNT in Atlanta and at a San Antonio station as a sports producer. He later became an instructor. He served in 2007 as a batting instructor with Legends Sports Complex near Houston. After his passing in 2014, his family wrote in his obituary of his love for instruction and teaching young men. "It was this work that brought him the greatest satisfaction," his obituary read, "and the outpouring of testimonials from his current and former players attest to that fact that he touched many lives."